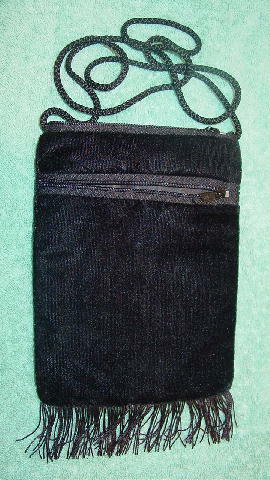 This black brushed cotton evening purse has a top side to side zipper opening. The back has a 3/4 length horizontal zippered compartment and is plain. 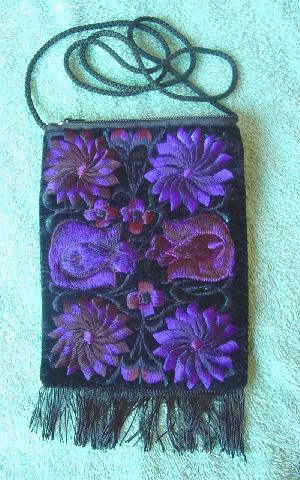 The front has embroidered flowers and stems in a touch of green, dark purple, wine, brown, and tone-on-tone black. It has a 45" black cord shoulder strap and a very thin 1 3/4" bottom fringe. There is a black acetate lining.